On This Date: Photo taken 3/28/2012. Demonstration Hall's really just a big gym, and has served as Michigan State's basketball field house and as its hockey arena. 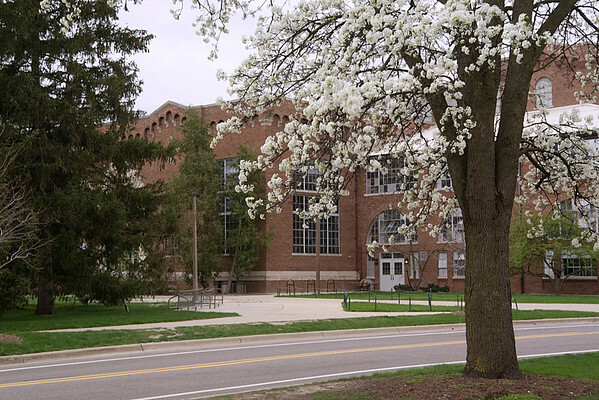 But always it's housed MSU's Military Affairs Department and the school's ROTC detachment as its primary function, with a secondary role as a practice facility for the Spartan Marching Band. Demonstration Field, where (among other things) the band rehearses its football programs, is adjacent to the building. It's an attractive building. I took this photo five years ago today after watching MSU's baseball home opener--against Central Michigan, as usual. The Spartans won. For this project I usually sort through my photographs the evening before each post. I normally pull out two or three images during that sort, then decide which to post in the morning, after I've given some thought to the writeup. Today's didn't go like that. I was dissatisfied with the pix I pulled yesterday, so I looked again this morning and selected a different photo.